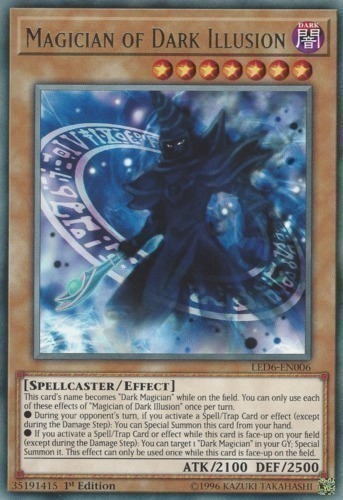 This card's name becomes "Dark Magician" while it is on the field. You can only use each of these effects of "Magician of Dark Illusion" once per turn. ● During your opponent's turn, if you activate a Spell/Trap Card or effect (except during the Damage Step): You can Special Summon this card from your hand. ● If you activate a Spell/Trap Card or effect while this card is face-up on your field (except during the Damage Step): You can target 1 "Dark Magician" in your Graveyard; Special Summon it. This effect can only be used once while this card is face-up on the field.